To See These Plants at My Garden Center! The CA Spring Trials was an awesome adventure and I don’t know where to begin botanically. Instead, I would first like to thank Diane Blazek, executive director of National Garden Bureau for being such an awesome tour guide. She has been visiting the CA Spring Trials for years and did an excellent job of giving us an orientation and a well-planned schedule of stops. I’ve decided to highlight some of the plants that continue to stand out in my memory since I’ve returned home. For day-by-day photos, please visit the NGB CA Spring Trials Collection on Plantsmap.com. 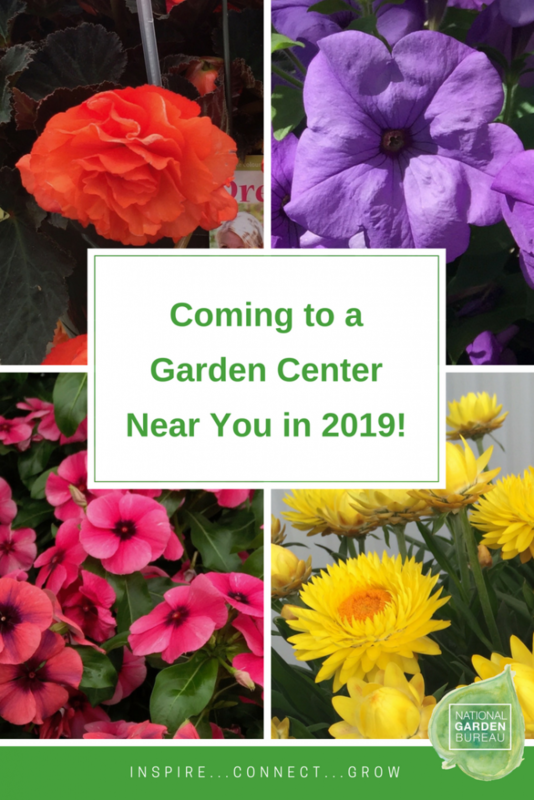 Since many of the plants that we experienced won’t be widely available to consumers until 2019, think of this as an early sneak peek at plants coming soon to a garden center near you. Edible Eye Candy – Who doesn’t love to pick fresh strawberries? The first ever AAS strawberry winner, Strawberry Delizz® F1 (on the left), is both beautiful and an everbearing type strawberry with large berries even in the heat of summer. I suggest enjoying this one your deck for easy recipe access. This variety is already available as both seeds and plants. Yummy! The Return Of The Strawflower – Strawflowers are fun and engaging plants. Not only are they interesting to look at, they are also interesting to touch. These long-lasting flowers are great for cutting gardens, sensory gardens and to use in floral craft projects. One breeder noted they were seeing these as a bridal flower trend. One that really stood out for me was a large, robust ‘experimental’ strawflower from Suntory Flowers, Xerochrysum Yellow (on the right). I learned that often a new plant is not introduced until it has a series or some ‘siblings’ in other colors, so I hope this family grows. A Vinca That Leaves An Impression – If I could have just one plant from CA Spring Trials it would probably be the new Vinca Tattoo™ series (photo on the left). These ‘living art’ flowers are described as a bold, fun, and head-turning. The flowers look as though they have been airbrushed with strokes of color. The Vinca Tattoo™ series comes in Black Cherry, Tangerine, Raspberry, and Papaya. Sorry, mom, I think I will need more than one Tattoo™! There’s a Begonia For That – Fragrance fans, flower lovers, and foliage collectors can rejoice as I’m sure a begonia that suits your fancy will be available in the garden center. Some of my favorites were the luscious Rex Begonias from Greenfuse Botanicals, the eye-popping I’CONIA Begonia hybrids (right) from Dümmen Orange, and the intoxicatingly fragrant DREAMS Begonias from Beekenkamp. But did you know Begonia flowers are also edible and a good source of vitamin C? To celebrate the 10th anniversary of BIG® Begonias, Benary commissioned a local brewery to create a BIG Beer served with an edible BIG Begonia flower garnish. Perhaps I will try growing a ‘citrusy’ begonia flower to float in my summer cocktails. Now add ‘edible’ to the long list of ways to use a Begonia in your landscape. SuperCals Will Take Over The World – I stood fixated looking at the ‘unstoppable’ gorgeous Super-Cal® (on the left) display for some time trying to figure why I would ever go back to regular petunias or calibrachoas. What is a SuperCal? Part petunia and part calibrachoa, these hybrid plants have the best traits of each parent: large flowers, vibrant colors and super easy to grow. Look for these smart-beauties to begin to dominate garden centers and landscapes everywhere. By the way, NGB has declared 2018 the Year of the Calibrachoa! Is That A Petunia I Smell? – Yes, the Evening Scentsation F1 Petunia (right) was my favorite fragrant plant at the CA Spring Trials. 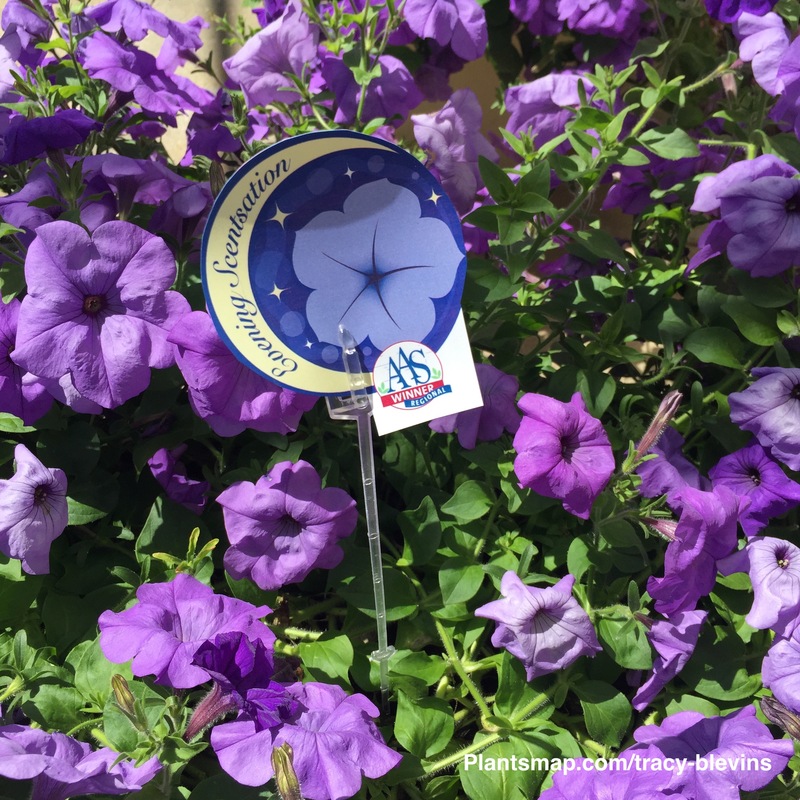 After experiencing this petunia it was easy to see why it is an AAS Winner. This would make a wonderful addition to an outdoor entertaining area as the fragrance is so very pleasant but not overpowering. Your guests will be saying, where is that fragrance coming from? I have to say I didn’t believe it until I smelled one for myself. 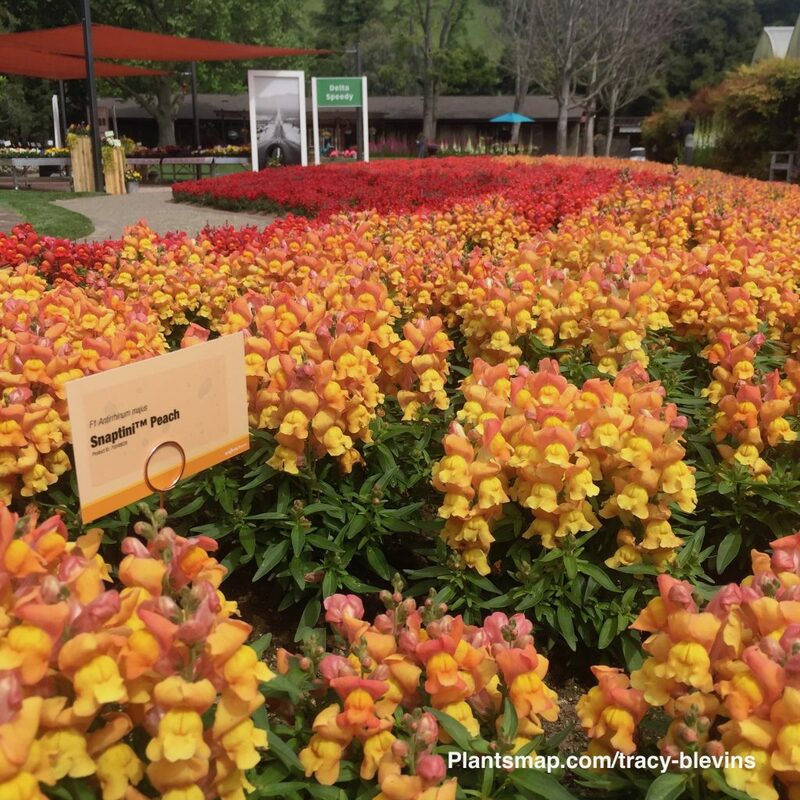 Not Your Grandma’s Snaps – One of the photos that I shared on social media that got the most attention was the Snaptini™ Peach Dwarf Snapdragon. People love these plants. The new Snaptini™ series demonstrate that really good things can come in small packages. With Snaptini™ Dwarf Snapdragons you get loads of flowers in a small compact size and they bloom over an extended growing season. Some colors are already available now and more are coming soon – just in time to for the NGB Year of the Snapdragon 2019 campaign. Snap! So those are a few of my botanical take-a-ways from CA Spring Trials. I hope you enjoyed them and will look for these and other new and improved plants at your local garden center. I could not possibly include all my favorites here so please visit my own CA Spring Trials Collection by Tracy Blevins on Plantsmap.com with photos of my 36 favorite plant picks. As Thomas Jefferson believed, ‘The greatest service which can be rendered any country is to add a useful plant to its culture.’ Thank you, everyone, at CA Spring Trials… now I’ve got some planting to do!